Need a great Christmas Day brunch recipe?! This French Toast is perfect for that salty-sweet fix. The savory stuffed french toast is jam-packed with ham, swiss, scallions, and cooked in a slightly sweet custard. Chop ham into small cubes. In a medium skillet over medium heat, add ham and cook until it’s browned in spots, just a few minutes. Let ham cool slightly and then stir together with grated cheese and scallions. 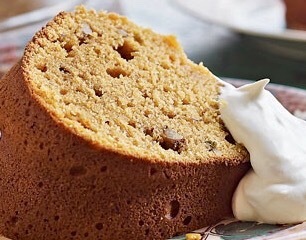 Whisk together milk, eggs, and cinnamon with a pinch of salt in a square baking dish. Cut your French bread into large 2-inch slices. Using a serrated steak knife, cut each piece of bread down the middle, being careful not to cut entirely through the bread. Use the knife and your fingers to make a pocket in the bread. Stuff each piece of bread with the ham and cheese mixture. Try to be careful not to tear through the bread, but you can also use a heavy hand on the stuffing. The bread can hold it. After you’ve stuffed all the pieces, heat a griddle over medium heat. Dunk the pieces of bread, one at a time, in the milk and egg mixture. Leave it in for a few seconds on each side so it absorbs the mixture. Don’t leave them in so long that they get soggy though. Melt butter on griddle and add stuffed french toast pieces. Cook for about 4-5 minutes per side until the toast is golden brown. Err on the side of cooking them for longer over lower heat. Also, be sure to stand the toast up on the two long ends for a few minutes also to really sear the French toast on all sides. I like to cut each piece in half after it cooks to show off the stuffing and also make it easier to eat. Serve stuffed french toast with syrup! This recipe is for those who love the crispy bits in their homemade macaroni & cheese. 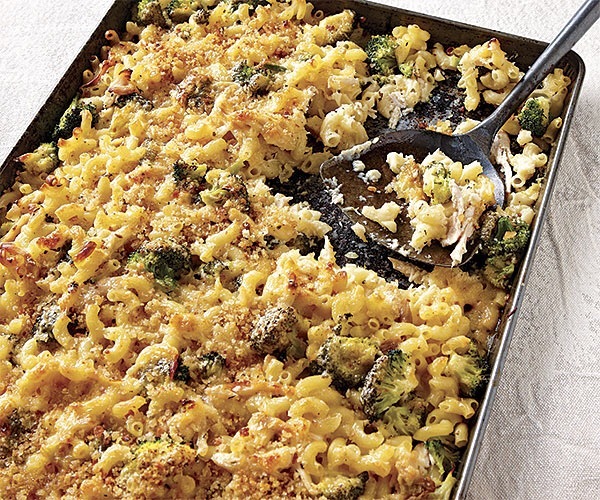 Baking macaroni and cheese on a sheet pan creates golden crispy bits. For even more crunch, sprinkle the top with breadcrumbs tossed in melted butter just before baking. Position a rack in the center of the oven and heat to 450°F. Generously butter a large rimmed baking sheet. Drain the pasta and broccoli, and return them to the pot. Add the chicken and the milk and cheddar mixture, and toss gently. Transfer to the prepared baking sheet, spreading evenly. Tear the Havarti into pieces, and top the pasta with it. Sprinkle with the remaining grated cheddar. Bake until golden brown and bubbly, about 20 minutes. Serve immediately.